Joomla content management system (CMS) is distributed free of charge as a compressed file. Prior to installing Joomla, you will need to download the compressed file, unzip it, and make sure that your hosting environment meets the minimum requirements for running Joomla. Go to Joomla’s home page and click the Download Joomla icon in the top-right corner of the page. The Joomla download page opens. Windows: If you’re downloading Joomla to a Windows computer running Windows XP, Vista, or Windows 7, click the Full Package link. Your browser asks you whether it should open or save the file. Choose the Save option, and save the file to a directory on your hard drive. Name the directory something clever like c:joomla so that you can find it later. Mac OS X and Linux: If you’re using an operating system other than Windows, click the Download Other Joomla 1.6.x Packages link, and then select the appropriate tar.bz2 or tar.gz file. (Your choice depends on the operating system you use.) When your browser asks whether it should save or open the file, choose the Save option, and save the compressed file to your hard drive. The actual download is surprisingly small. A lot of functionality is packed into that small package, and to unleash it, you have to uncompress it. Use your favorite uncompression utility, such as WinZip for Windows or StuffIt for Mac OS X to extract all the files inside the archive you downloaded. 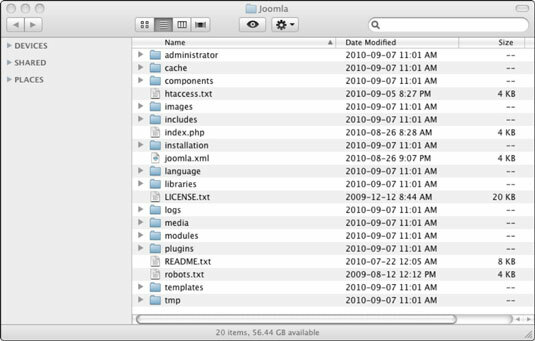 When you uncompress Joomla, it opens as a bunch of directories and files. You can install Joomla remotely (on a host’s server) or locally (on your own computer). Either way, you have to meet Joomla’s minimum requirements so that you can actually run the installed program. If you’re installing Joomla on an ISP’s server, check out the minimum Joomla requirements. You need support for the PHP scripting language MySQL (future versions of Joomla may support other database systems) and a web server such as Apache. You can check with your ISP to see whether it meets the minimum system requirements, but finding out can be difficult at times: ISPs often don’t make the version of their installed software public. The easy way is to just go ahead and try to install Joomla; the second step of the installation process tells you whether your host meets the minimum requirements. You can install Joomla on Linux, Windows, and Mac OS X computers. Although the recommended web-server software is Apache, you can also use Microsoft’s Internet Information Services (IIS), which many Windows users already have installed in Windows XP, Vista, and Windows 7.